Arrow Electronics is the world’s largest distributor of components and enterprise computing systems. It’s tempting to portray it as the world’s biggest IoT warehouse. But it’s much more than that. Arrow started in 1935 selling radio sets, a relatively new retail technology at the time. Today it’s a $23 billion business operating in 56 countries. Arrow has roughly 17,000 employees that include thousands of field application engineers and systems engineers who help companies bring exciting new technologies to scale. For many decades, Arrow was happy to conduct its business as straightforward and extremely profitable parts warehouse. It distributed electronic components to thousands of technology companies. “Before you would come in and say I want a processor or I want an electro mechanical component, it could be a crystal oscillator or some kind of passive device. You would have a conversation with us about that, and we would go and buy that from someone and sell it to you for a slight markup,” says Chief Digital Transformation Officer Matt Anderson. But Anderson said the company recognized a decade ago that they needed to shift their business model from a commodity provider towards value-added services. They needed to stop acting less as a Home Depot for the tech industry, and more like a Bell Labs. These days they’re having very different conversations with their customers. In other words, Arrow’s customers used to come to them asking for isolated components. Now they’re looking for integrated outcomes. As a result, Arrow is offering design engineering services and system administration to help innovators bring their ideas to fruition and close gaps in knowledge and skill sets. They’re helping innovators surface the intrinsic value of their products. They started thinking in terms of desired outcomes, not stand-alone devices. Arrow now offers a subscription service to manufacturers that allows them to search over 300 million electronic parts for cross references, lifecycle, parametric, obsoleteness forecasts, regulation compliance, and inventory data. They can then apply that data to the manufacturer’s bill of materials (BOM) and active updates can be sent to manufacturers as updates to these components are made. Working with a major fast-food dining chain (it’s one you’re definitely familiar with) to automate, monitor, and put sensors on every single piece of kitchen equipment. The data collected can then be connected with intelligent customer menu boards and headsets. This allows the management chain to collect and use an enormous amount of data – whether equipment is in good working order, do certain menu items need to be removed, can the menu be tailored for surge demand, etc. A biotechnology firm is building a new network of insect pheromone detectors that, when it picks up specific signals, automatically sprays a dispersant rather than using pesticides, leading to healthier food. Everything is automated, from the data the crop manager sees about insect patterns to the machine that sprays dispersant. They’re even working to build a better mousetrap: an automated trap that monitors activity and effectiveness, certifies that it’s meeting regulations that restaurant chains and grain elevators must abide by, and notifies the manager of any problems. Learn how IoT is enabling businesses undergo a fundamental business model change from products to services! The thing about IoT, says Anderson, is that it’s growing in previously unimagined ways. With all this new data comes new possibilities. Companies like Arrow have made IoT innovation more accessible to not only large corporations, but also small-scale innovators of the type found on Kickstarter and Indiegogo. So how does Anderson describe the difference between a transactional customer and a solutions-based subscriber? Anderson goes on to note that subscription-based businesses enable a lot more players in the innovation market, simply because they are able to build products that don’t cost a lot up-front. As long as they can continue to make their subscriber base happy, they can invest more money more in innovation and continue the virtual cycle. Arrow’s founders probably wouldn’t have envisaged a future where entire segments of their product catalog would be treated as a loss leaders! Many of their customers give their new integrated products away for free, in order to kick-start smart, mutually-beneficial subscription-based relationships. Today the IoT is making every single industry and every single company a potential subscription business model participant. 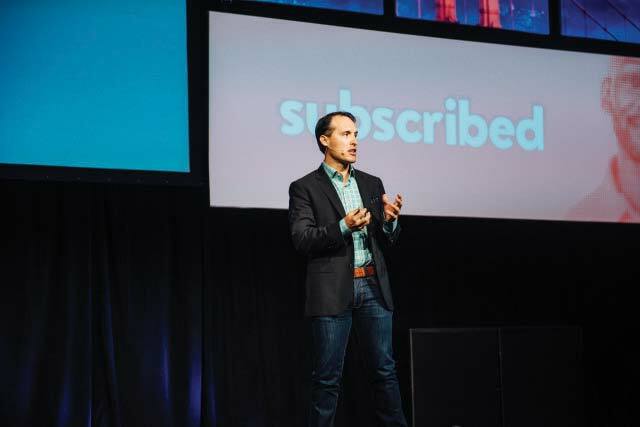 “If you are a fan of innovation, you are fundamentally a fan of the subscription economy,” says Anderson.